What Can and Cannot be made with Whole Grains? I've been using whole white wheat flour for about 4 years now, 2 of which I have been grinding my own hard and soft white wheat flours. Our grinder is excellent and grinds them so fine that I cannot feel any hard "granules", all I feel is soft powderiness, like you would expect from processed storebought flour. Read more about What Can and Cannot be made with Whole Grains? Though I haven't posted about bread in a while, I have my reasons. No, I am still working at the bakery baking bread daily which hasn't made me bread-sick. I still am studying to complete my degree (end of this fall it looks like!) but I make time for the important things in life (like baking!). But what is keeping me away from bread is that I am working towards my American Culinary Federation Certified Pastry Chef title, which I hope to obtain this year. What that means is I have been baking a lot of genoise cakes, cookies and attempting Bavarian cream. Since those are the required pastries to be made for the practical examination. Today, after getting off my shift I went ahead and made some molded Bavarian cream which is actually still in the fridge due to other time restrictions and appointments, but also went ahead and changed my game plan when it came to my cookies. I decided against my original molasses and oatmeal raisin cookies and went for the more familiar. Although I am still sticking with my two brownie recipes I decided. It's not that my molasses or oatmeal raisin recipe were bad, it's just I thought I should pay homage to the bakery that has taken me in and taught me so much. I took a look at some of my aforementioned baking knowledge from working at a bakery that promotes whole grains and decided to make a two cookies using 100% whole wheat flour. They are different than what I make at the bakery by a long shot, but they remain true to using entirely whole grains. 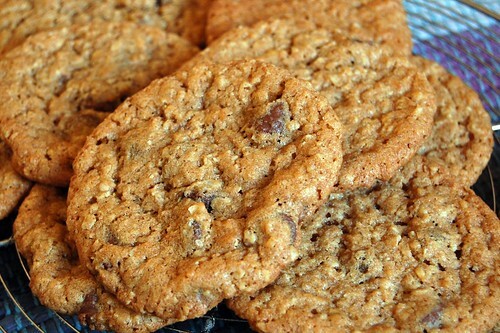 The end result was a deliciously chewy whole wheat oatmeal cookie, and whole wheat oatmeal chocolate chip cookie! I made roughly four dozen, two and half went to my fiances work to be shared (they see lots and lots of my pastries from homemade poptarts, cakes to truffles) and the other half will be for her father, who is in the armed forces and is going overseas to the middle east again this month. I am very pleased with the taste and texture and am glad I went with something I am familiar with. I think it will bring along confidence when it is time to step up to the plate. I took Lahey's No-Knead recipe for Pane Integral, and experimented with it a little bit. I used 2 cups of whole wheat and 1 cup bread flour and 1/4 cup of flax seed. The water, salt, and yeast amounts are the same. Everything looked pretty much identical to the 100% bread flour recipe, but when I baked it in the Dutch oven the center of the loaf is sunken. The taste is and the crust is crunchy, but I'm not sure why the center of the bread didn't rise (or maybe it fell?). Any ideas? I know that most of us, that culture wild yeast, seldom actually "discard" the discards of our sourdough. Of course, it is not unusual to hear someone new to keeping a sourdough culture remarking that they hate to have to through out the discards. And again, of course, a dozen replies of "No! Make pancakes..." or "Oh, no! Make waffles... ". Well, from now on, I will be crying "No! Make sourdough crackers.. 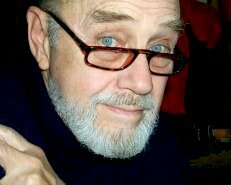 The older the discards, the better the crackers!" Naturally, that does assume you like sour sourdough, but the crackers are great even with "un-sour" sourdough discards, Rye Sour, etc. or even non-discarded levain as the leavening ingredient. It certainly looked simple enough, so I tried it. I am certainly glad I did, although, a batch never last very long and another few hundred calories have been ingested. So, here is a step by step, complete with photos, Baker's percentages, some suggestions, and pointers on the ingredients and process. Even if you are not of an experimental curiosity by nature, I suspect you will have some ideas for variations you would like to try. A small amount Sesame Oil, or Olive Oil to brush the top of the crackers and Kosher salt to sprinkle over the oiled surface will also be needed. Substitutions of butter or lard can be made for the coconut oil, but I prefer the coconut oil, either the Extra Virgin, or the Expeller types. Notice that I chose the ingredient amounts to exactly match the Baker's percentages. This batch size works very well for one sheet of crackers per Silpat baking sheet and a 100 grams of discards is an equally reasonable size. If you wish, make multiples of this amount and store in the fridge until you want more crackers. I do want to mention some considerations to keep in mind when using coconut oil. Using the Extra Virgin Coconut Oil is my first choice, Expeller Coconut Oil is my second and neither one requires special consideration in a warmer kitchen, but if the kitchen temperature, or the dough temperature, is below about 78ºF ( 25.5º C) then you should either use methods to maintain the temperature of all ingredients about 78ºF ( 25.5º C) during the mixing phase, or use softened butter. Coconut oil is liquid from about the 75ºF ( 23.9º C) and above. Adding it in a mix of cold, fresh out of the fridge, levain may very well cause lumpy, difficult dough conditions. Once the full mixing is complete, this is no longer of any potential problem. Let your finished crackers cool before placing (if any are uneaten) in an airtight container to preserve their crispness. Today's bake was a 3-seed sourdough. I previously posted all ingredients and the method I used, and had to go, and lost it...sigh. Next time :) Here's the pics...tastes lovely. The seed soaker added extra water even after I drained it. I can't tell if I underproofed or not. The crust was nice but I didn't get as much vertical lift as I had hoped. My scoring kind of just melted back into itself. I like this a lot better than the wheat germ one, but I think next time I use wheat germ I will soak it first. I soaked my terra cotta lid for a couple of hours before I baked it. Whole Wheat &/or Flax Seed Starter???? I'm making a Sourdough starter, rather small at 15g flour and 15g water. or fresh Flax seed ground to a flour? It would probably change the tastes, but would it work?? Also, I live in Annapolis, on the water. (unlike my condo which is warm but smell like a bachelor LOL..
fresh yeast is blowing out there. Read more about Whole Wheat &/or Flax Seed Starter???? Before I went and watched my boss's dogs and house while he was away on vacation, I managed to bake a few loaves of bread that I did not get a chance to blog about. 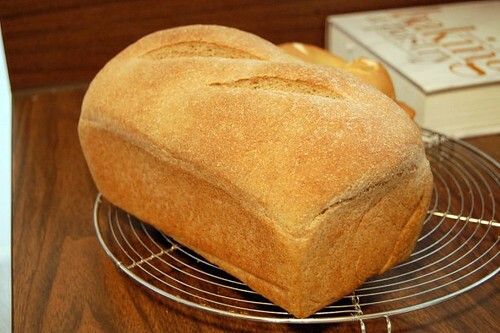 The first loaf was a 100% whole wheat mash bread from Reinhart's Whole Grain Breads. I was rather curious about this loaf after having made a few rye breads using Hamelman's hot rye soaker technique. What I remembered from those loaves is the mash imparted a slightly sweet taste to the final loaf as if there was a touch of sugar or honey. Bwraith blogged about this bread as well seen here; Whole Wheat Mash Bread. There is no need for me to rewrite the recipe since it is available on Bwraith's blog, which he kindly supplied in his post. I only made two changes to the loaf. I used a whole wheat starter in place of the biga, as Reinhart provides as an alternative leavening agent. Also I left out the suggested sweetener in the recipe for two reasons; I felt many of Reinhart's recipes from WGB to be far too sweet to begin with, and second because I wanted to see the potential of the mash. To my surprise I found the end loaf to have a full 'whole grain' taste which I desired, a slightly sour taste, but only a slightly sweet taste too. I half-expected the wheat mash to match the rye mashes I have dealt with before, but to my surprise it couldn't compare. Though this loaf was still very tasty. I imagine the sweetness I was looking for has to do with the more ferment-able sugars found in rye. The next loaf of bread I baked was from The Culinary Institute of America's Baking and Pastry book. 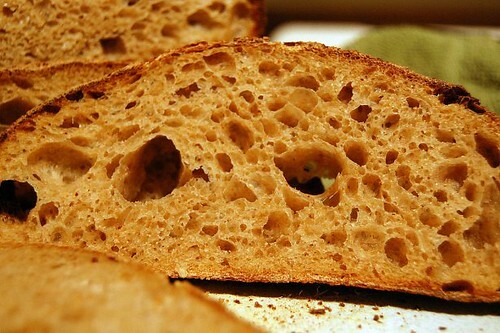 *Starter used was a 50/50 of Sir Galahad and Fresh Milled 100% Whole wheat flour. As with the whole wheat flour used in the loaf, it too was fresh milled. 1. Combine the flours, water, sourdough and mix on low speed for about 4 minutes. Let the dough rest for 20 minutes. Add the salt and mix 1 minute on low and then 2 minutes on medium. 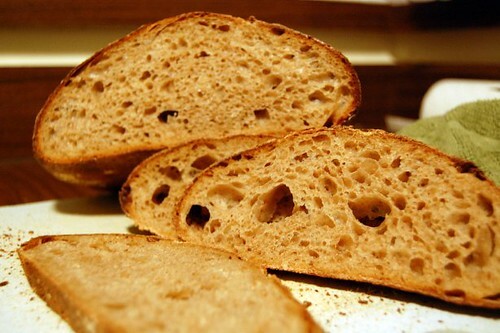 Aim for a improved stage of gluten development. The dough should be slightly soft but elastic. 2. Bulk ferment the dough until nearly doubled in volume, about 1 hour. Though it took me about 3 hours in a cold apartment. Fold gently and ferment for another hour. Fold again. Ferment for another 20 minutes. 3. Preshape the dough into a round and let rest for 15 - 20 minutes. 4. Gently shape the loaf into a batard or round when sufficiently relaxed. 5. Place in a banneton lightly floured and covered with plastic overnight in the fridge to have a slow final rise. 6. When the dough has risen, or the next morning, preheat your oven with your dutch oven or cc, or latest crazy steaming method to 470F. 7. When preheated, remove bread from retarder, load into your oven, score and cook covered (or steamed) for twenty minutes. After twenty minutes remove steaming apparatus, bake in a dry oven for 17 minutes, or until loaf registers 200F, sounds hollow when thumped or looks nice and done to you! 8. Cool completely, slice and enjoy. Two different loaves, but both very tasty. Mix till all is moistened, then cover and let sit for 8 to 24 hours, best if it is actively bubbling when you use it. Can be refrigerated after about 6 hours for up to 3 days. I set the ingredients out before starting, measuring them with my scale. I used my kitchenaid to mix for about 2 minutes, then allowed the dough to rest for 30. I then kneaded the dough for about 6 minutes, shaped it into a ball, and put it into a bowl to rise for a couple hours. It took closer to four hours from what I remember. I pulled it from the bowl ad shaped it, then allowed it to rest for 10 minutes. I cut it into two pieces, and used 1 lb 12 oz in my clay baker and the rest were made into kaiser rolls. I have been trying to figure out how much dough to use in my clay baker, if 2 lb 4 oz was to much and 1 lb 12 oz was not enough, then maybe next time I should try 2 lbs of dough. I put the clay baker into the oven and turned it on to 425* baked for 30 minutes and then removed the cover and baked at 380* for another 15 minutes. I think the crust color is just about right. The loaf of bread was a little disappointing, when I pulled it from the oven. Thought I had misread my dent in the dough test, but while it might have been a little better with a slightly longer rise time I think the crumb is actually ok. It is just a short loaf that took the shape of the pan, probably because I like my dough more hydrated. I will definitely put more dough in, and might try a little bit less water next time and a little more shortening, plus I might try 50% whole wheat and 50% bread flour. Not real sure why I had cracks in the crust, another reason I thought this was going to be a brick. The flavor is outstanding in this bread, probably because I left the poolish in the fridge a couple extra days. Happy this turned out so much better than I thought it had, now on to making my Greek Celebration bread from BBA. This should be fun! 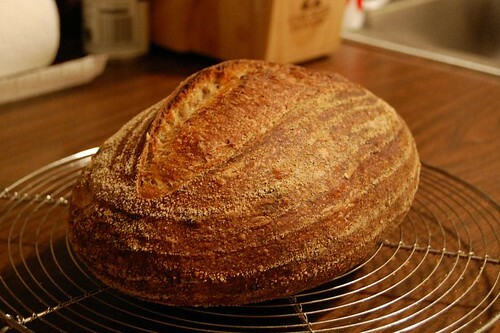 Anyone have any good or bad baking experiences to share using flours from Great River Organic Milling in Wisconsin? No shipping fees thru Amazon & they have an organic 100% Whole Wheat bread flour. They used to be Little Bear Milling, which was one of the recommended sources for good flour in Laurel's Bread Book. I have just ordered some, but says it's 2-5 WEEKS for shipping. Read more about Great River Organic Milling? Whole Wheat bread crumbling, help! I am using the original recipe from 30 years ago that a mormon introduced me to and found on this forum. I am Using a Bosch Universal Mixer. After several days in the fridge I notice my bread is very crumbly. Could I be adding too much flour? Any other ideas? 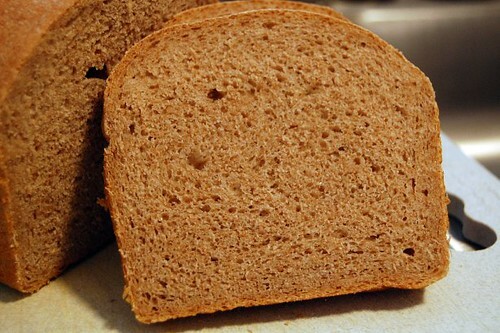 Read more about Whole Wheat bread crumbling, help!